Saturday is a quiet day at Scrabster Harbour at this time of year but it does make it easy to take pictures. Here we go right round the harbour looking at the older buildings and the new ones covering a large part of the harbour. Much of the fish market area is dominated by D Steven Ltd who have lorries constantly on the road transporting fish from Scrabster consigned south. Anyone who travels the road south will always see Stevens lorries going north and south at almost any time of the day or night. The port is always changing and the new fishery office is now in use. Some things remain the same and the wee gargoyles still look out over the comings and goings of the harbour. 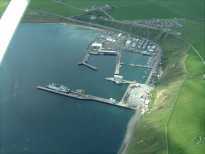 The Orcadians are talking about a tunnel to Orkney so perhaps the port will have a different look in years to come ( For the sceptics they are deadly serious and have looked at the fact that Norway already has the know how and has built a number of long range road tunnels connecting remote areas.